Fifteen? Wow! That’s more benefits per jug than you’ll get in just about any food. Wheat grass or wheatgrass—I’ve always wondered which is the correct spelling. Turns out, according to my English gurus, either’s just fine. It is wheat. Specifically, it’s young wheat plants, harvested in their early, grassy stage—at the very height of the plant’s nutritive value—the leaves then (usually) dehydrated and packaged or juiced. You can consume wheatgrass powder, wheatgrass tablets or wheatgrass juice. Hopefully, it’s a staple—in several forms—at your local fresh foods market. As for me, I’ll take any given food—especially one so nutritionally rich as wheatgrass—in its freshest, least processed form, which here means fresh squeezed. 1. It helps you reach and keep your ideal weight. Concerned about protein? Then know that wheatgrass is a complete protein, and easy to digest. 2. Wheatgrass restores bloodstream alkalinity, reducing over-acidity. Calcium, magnesium, potassium and iron are here, but so are about 85 other useful minerals, helping create the alkaline environment which fights disease. 3. You can use it to ease internal discomforts—peptic ulcers, ulcerating colitis, irregularity, diarrhea, excess weight, and indigestion. 4. Wheatgrass—especially in fresh form—is a superb body cleanser. Wheatgrass juice enhances our cells, cleanses the liver and bloodstream, and chemically reduces the effects of toxic waste. 5. Applied topically as a plaster, changed a few times a day, it can eliminate growths and help you recover from cuts, burns, scrapes, rashes, poison ivy, insect bites, boils, sores, open ulcers, growths, and more. 6. Relieves itching and sunburn right away! Helps tighten loose and drooping skin. 7. Because it contains chlorophyll, the “blood” of plants, it supports the operation of the human blood system. 8. Used as a rectal implant, wheatgrass juice reverses damage inside the lesser bowel. 9. Rubbed into your scalp before you shampoo, wheatgrass juice will aid hair growth and relieve scratchy, scaly, scalp. 10. Put a tray of living wheatgrass near the head of your bed and you’ll boost oxygen in the air and produce healthy ions to help you rest more peacefully. 11. Great to add to your bathwater for a nice long soak. 12. Sweetens your breath and improves your gums—just gargle. I even included it in our Oral Balm. 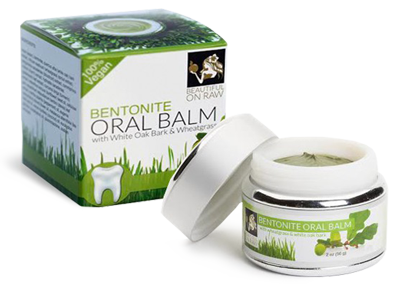 To find out more, visit Bentonite Oral Balm with White Oak Bark and Wheatgrass. 13. Gives your body a great oxygen boost, promoting good digestion and helping resist cancer. 14. For some people turns their gray hair to its natural color once more—just use it daily. 15. Slows the aging process. Wheatgrass’s vitamins B, C, E and beta-carotene eliminate free radicals. How Does One Consume It? How best to take your wheatgrass? Tablets are okay—but why risk the effects of processing? Juice works great. Many health food stores now offer “shots” of wheatgrass. They juice it right in front of you. The very best way, I believe: Juice your own fresh wheatgrass! I suggest learning how to grow wheatgrass, which will make this practice more economical and result in the most wheatgrass benefits! How to Juice Wheatgrass Without a Special Juicer? Place some wheatgrass in a blender. Add a little bit of water. I usually use a few ounces of distilled water. Blend it till it’s all pulverized and you see this lovely green juice, with a bunch of pulp in it. You want to keep the juice and lose the pulp. Use a fine filter—cheesecloth is great—to pour the mix through, catch the pulp, and save that wonderfully nourishing juice in a bowl or glass below. Try adding a slice or two of apple—it’ll make the juice more palatable. Some people find that holding their nose closed as they down the wheatgrass juice is the way to go. I’m betting, though, that, as you start to feel the health benefits of wheatgrass, you’ll begin to enjoy the fresh, aggressive taste of one of the few true superfoods out there!